Our Diamond Glossary presents an overview of terminology used to describe diamond color, diamond clarity, diamond cuts, carat weight, and more. Using this glossary will help to simplify the process of selling your diamond online, and ensure that you receive the best quote possible. 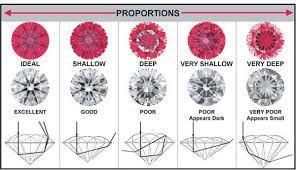 Check out our different types of diamond definitions! An acid boil is used to clean diamonds, and includes one part nitric, two parts sulfuric which are heated to boiling point. Extreme caution is advised. Cleaning before you sell diamonds online can increase your diamond’s value! An abrasion is a small scratch on the surface of a diamond or colored gemstone. In a diamond, these are usually white in color and caused by contact with other diamonds. A blemish, such as small nicks along the facet junctions (often will look whiter than the rest of the diamond). The cause is often from impact that damages the stone. Excessive abrading often a sign that the stone is cubic zirconium, not diamond. Abrasions on a diamond can reduce the diamonds value. Consult an experienced diamond trader before you sell your diamonds online. An abraded culet is a damaged culet (point on the bottom of a gemstone) that broke off or has chips or abrasions. Absorption spectra is a reflection of the electromagnetic radiation absorbed by a colored diamond or colored gemstone over a visible range of wavelengths (approximately 400-800 nanometers). They are recorded on a graph that plots the transmittance against wavelengths. And they can help identify the species and/or variety of stone, as well as the color origin of colored diamonds. The American Gem Society (AGS) is a professional jeweler’s society founded in 1934. AGS has a laboratory which grades diamonds and offers a diamond grading report. AGS has a cut grading system for round diamonds. Getting a diamond grading report from AGS can significantly increase the value of your diamond, and you can get more money for selling diamonds online. The American Gem Society is one of the leading gemological labs in the country, and grades hundreds of thousands of diamonds. 0 Ideal, 1 Excellent, 2 Very Good, 3-4 Good, 5-7 Fair, 8-10 Poor. Those proportions and facet angles calculated mathematically by Marcel Tolkowsky to produce maximum brilliancy consistent with a high degree of fire in a round diamond brilliant are considered by many diamond men to constitute the ideal cut. These figures, computed as a percentage of the girdle diameter, are as follows: total depth, 59.3% (without provision for girdle thickness); crown depth, 16.2%; pavilion depth, 43.1%. The bezel angle is 34° 30’ and the pavilion angle is 40° 45’. Girdle thickness as a percentage of the girdle’s diameter varies with size. The larger the stone, the smaller the percentage for a medium girdle. The variation is from about 1% to 3%. on a diamond, a controlled temperature process that heats and, then, quickly cools the stone. This treatment is applied individually or in conjunction with high pressure and high temperature (HPHT) and/or irradiation. An appraisal is a written estimate of the approximate retail replacement value of the item described. They can be used for insurance purposes and should be updated every few years. Check your appraisal to make sure you get the appropriate value for your diamond before you sell it. Please Note: While Appraisals might assist in giving a basic description of an item but are often not as accurate as GIA lab grading. Furthermore, appraisals provide an exaggerated amount of the retail replacement value of an item, not the re-sale value. It is a stepped square cut, often called the “square emerald cut” and like an Emerald Cut, the Asscher has cropped corners. A rectangular style of step cut used for diamonds and colored gemstones. Baguette cuts often get high resell values. Contact The Diamond Trade today, and sell diamonds online. Small hairline fractures running from the girdle into the gemstone. It is also known as “bearding”. The large facets (second to the table) on the crown of a diamond. On a round brilliant diamond, these are eight large kite-shaped facets on the crown. Also called top main facet. In a setting or ring, the stone is secured in the mounting by a thin strip of metal surrounding the stone’s perimeter. When a diamond is dark gray, a very dark green or truly black, it is referred to in the trade as a “black diamond.” Such a stone may be opaque to nearly semitransparent. The black inclusions visible within a diamond. These can be more detrimental to the diamond’s value than white (or clear) imperfections. However, it always depends on the appearance of the inclusion and affect on the diamond’s brilliance. Diamond grading reports will often treat white and black inclusions the same for clarity grading purposes. A surface feature on the exterior of a diamond or colored gemstone, such as an abrasion, natural, nick, or scratch. A blemish can affect the finish of a stone. An imperfection on the surface of a diamond. A diamond can be internally flawless (IF), even if it has blemishes, including scratches, nicks and abrasions. Blemishes can usually be easily removed by polishing. A diamond with a distinctly blue body color, even thought very light in tone, is a fancy diamond. 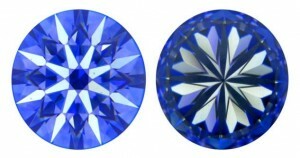 Diamond that are blue in both daylight and incandescent light are rare, although fluorescence stones that show a blue color in daylight are comparatively common. A blue color may also be induced artificially. A term that has been used for many years to refer to a diamond without body color. However, it is applied frequently, but incorrectly, to stones that have a distinct yellow tint. Federal Trade Commission rulings state that is it an unfair trade practice to apply the term to any stone having a body color other than blue or bluish. An American Gem Society ruling prohibits the use of the term by its members. Flagrant misuse has made the term meaningless. A dark shadow shaped like a bow tie. This effect is apparrent in some cuts of fancy shaped diamonds, such as ovals and marquises. This is detrimental to the value of the diamond if very noticeable. Also called Brightness. Brilliance in white diamonds describes the reflections of white light coming from the diamond. Brilliance refers to the overall strength of a stones light return which is an average measured in the face-up position.. Brilliance is the effect of all the reflections of white light, both within and external to the diamond. The degree of brightness displayed is correlated to the diamond’s cut grade. A diamond exhibiting a high level of brightness will attain a very good or Excellent cut grade, for example. Whereas, a diamond exhibiting low brightness would probably attain a Poor cut. See also Light Performance. The most common style of diamond cutting, also used for some colored gemstones, traditionally consisting of a combination of triangular, octagonal, and kite-shaped facets. See also Cut (Shape and Style). The optimal cut of a diamond so as to provide maximum brilliance. A round brilliant has 57 or 58 facets (including the culet). Many fancy shapes have brilliant versions, including the cushion modified brilliant, the square modified brilliant (also known as the princess cut) and marquise brilliant. Brilliant cut, or princess cut, diamonds typically have high resell values. Sell your diamonds online to The Diamond Trade. The last stage in cutting a brilliant which on a round is the remaining forty facets. These facets are the sixteen upper girdle facets, the sixteen lower girdle facets and eight stars. The girdle facets are sometimes called upper and lower halves. A minute imperfection that breaks the surface of a diamond or colored gemstone. A bruise is an inclusion (of small cracks or feathers) at, or near, the surface of a diamond. On a diamond or colored gemstone, a girdle that is cut, but unpolished. Often called a “Frosted Girdle” because it is soft white, similar in appearance to frosted glass. The craftsman that specializes in the bruting, (girdling), or rounding of the elliptical shaped diamonds. See bruted girdle. A unit of metric measurement used for diamonds and colored gemstones. One carat (ct.) equals 100 points, 200 milligrams, or 1/5 of a gram. If you are trying to sell a diamond online, be sure to find out the carat weight. Heavier weights have higher resell value! The chart below illustrates carat weights for diamonds. A canary diamond is a common term used to describe a yellow diamond. GIA uses terms, such as fancy light yellow, fancy yellow, fancy intense yellow and fancy vivid yellow, among others to identify canary diamonds. Cape diamonds are generally within the range of M to Z on the color grading scale. Again, this is not a technical term used on GIA grading reports but is used in the diamond business regularly. The named is used since many lower color diamonds (M and lower) have been traded out of Cape Town, South Africa. Diamond’s primary composition. A diamond made of pure carbon would be colorless. Carbon spots is a common term for black or dark inclusions in a diamond. The technical name for them is black pique. Black pique are more detrimental to a diamond’s value than white or clear imperfections, as they are often more eye visible. Carbon spots are often “graphite” but are often mistakenly called “carbon spots”. They do rarely occur in diamond and are usually mistaken for dark included crystals. A cavity is an isolated opening that breaks the surface of a diamond or colored gemstone. An open imperfection in a diamond. A type of inclusion consisting of a large or deep opening in the diamond. Cavities often break off from feather (cracks in diamonds) that extend to the surface of a diamond. The central selling organization (CSO) is an organization in which all of the major diamond producers sells their diamonds on a cooperative basis. Some labs refer to their grading reports as certificates. They are often laminated (for longevity and to prevent tampering) and provide written documentation of the diamond’s natural occurrence, weight, proportions, color grade, clarity grade, cut grade, and other characteristics and qualities of the diamond, including any treatments. A greenish-yellow to yellow-green diamond of a sufficiently pronounced hue to be an asset. Such a stone is called a fancy. A shallow, jagged surface break on a diamond or colored gemstone. An inclusion on the surface of the diamond where a piece of the diamond has broken off. This can lower the value of the diamond, as the diamond needs re-cutting to return it to its original state. This can lead to the diamond ‘breaking its weight’ (going below important or magic weight levels, such a 1.00 cts). Clarity is a diamond’s relative lack of clarity characteristics. Inclusions (fully enclosed within the diamond) and blemishes (surface imperfections) determine clarity. A clarity grade is determined by the overall effect of the clarity characteristics. Specifically, the size, number, position, nature and relief of the characteristics are all factors. The degree to which a diamond is free from blemishes / inclusions. Clarity is graded on a scale from Flawless (FL) to Imperfect. FL Grade (Flawless) describes diamonds in which a skilled observer does not see any inclusions or surface blemishes, after thorough examination at 10-power magnification under standardized lighting conditions. IF Grade (Internally Flawless) describes diamonds that have no internal characteristics observable under the conditions described above, but that may have minor blemishes confined to the surface. VVS Grades (Very Very Slightly Included) describe diamonds with very, very small inclusions that are difficult for a skilled observer to see, under the conditions described above. VS Grades (Very Slightly Included) describe diamonds with very small inclusions ranging from difficult to somewhat easy to observe, under the conditions described above. SI Grades (Slightly Included) describe diamonds with small inclusions that are easy or very easy to see, under the conditions described above. Occasionally, inclusions in the SI category are visible to the unaided eye. I Grades (Included or Imperfect) describe diamonds with medium or large inclusions that are usually obvious to the unaided eye, under standardized lighting conditions. Size: A large inclusion makes for more of an inferior grade than a small one. Number: Generally, the more inclusions the worse the clarity grade. Though, one large inclusion can be worse than several small ones. Position: An inclusion under the table (in the center of the diamond) is more visible than one on near the girdle and thus would be more detrimental to the clarity grade. Nature: The type of inclusion can determine the clarity grade. A feather that runs from the crown through the girdle will result in a far worse clarity grade than a crystal in the crown. Relief: Most inclusions are white or colorless, but some are black or even red. Dark inclusions are more visible and thus factor more into the clarity grade. A red inclusion might look unique and interesting, but it will result in a lower clarity grade than if the same inclusion were colorless. Any process used to improve the apparent clarity of a diamond. This may include filling fractures and cavities with glass/resin. 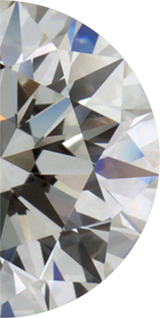 Man-made actions (other than cutting and polishing) to artificially improve a diamond’s appearance and or clarity grade (whether temporarily or otherwise). Treatments can include fracture filling or laser drilling. A major fracture or weak point in a diamond that is breakable in certain definite planes or directions, usually due to weak molecular bonding. A large, straight break or inclusion in the diamond along a plane. A piece of cleavage is an octahedral face that has been cleaved off a whole crystal either by man or nature. See cleavage feather, cleavage grain. Internal imperfection (inclusion) that sometimes resembles a bird’s feather and runs parallel to the cleavage plane (octahedral face) of the diamond. Each cleavage plane is made of three single grains. Cleavage plane should be used in place of grain for the purposes of describing the splitting or internal cleavage feathers. In a diamond or colored gemstone, a cloud-like, semi-transparent area created by minute pinpoint inclusions. A significant amount of “clouds” that affect the brilliance of a diamond will also decrease the value. A term used to describe a diamond with so many small inclusions that it looks like a single, white “cloud”. Dark brown in color grade. A more desirable color than the dark brown it shows an orange-brown mixture similar to the color of cognac. The common meaning of this term is “reasonably free from inclusions.” However, these diamonds are often very included and of a low grade (i.e. I1,I2,I3). A diamond’s color grade is based on its depth of color. Diamonds that range from colorless (D) to light yellow (Z) or light brown fall into the D-Z grading range. Beyond the Z grade, you have fancy color grades, such as fancy light yellow or fancy light blue, fancy red, fancy intense blue, fancy vivid pink, fancy dark blue and fancy deep pink. Fancy red diamonds are extremely rare. See Colored Diamonds. Elements such as nitrogen and boron reflect certain color back to our eyes. A colorless diamond is free of color-altering-elements. In some diamonds, known as chameleons, a phenomenon in which their color changes when exposed to certain intensities of heat or when kept in darkness for an extended period of time. In some colored gemstones, a phenomenon in which their hue appears to vary when exposed to different types of light. man-made action to improve or change a diamond. Another man-made action to improve or change a diamond (whether temporarily or otherwise). Methods of color enhancement include High Pressure High Temperature treatment (HPHT), irradiation or the use of a coating to add color. The first two are usually permanent enhancements, while the latter can be removed through polishing or boiling the diamond in acid. Color enhanced diamonds are worth far less than non-color enhanced diamonds. An assessment of the homogeneity of color in a colored diamond, as seen through its crown. It is measured on a scale ranging from uneven to even (which is preferred). 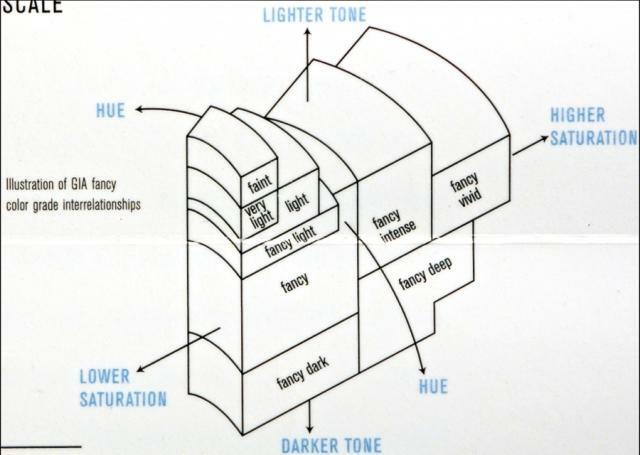 Are distinguished by a combination of hue, tone, and saturation. Fancy colored diamonds are graded on a scale from fancy light to fancy vivid. Colored diamonds outside of the fancy range are rated as faint to light. While remarkable diamonds exist in many colors, natural fancy vivids are typically the most rare and valuable. Faint, Very Light, Light, Fancy Light, Fancy, Intense, Fancy Vivid, Fancy Deep, Fancy Dark. The chart below depicts these variations for a yellow diamond used by GIA. A scale that identifies diamonds or colored diamonds according to color. For colorless to light diamonds, color is graded on a scale from “D” (colorless) to “Z” (possessing a strong tonal modifier, such as brown, gray, green, pink, or yellow.) The chart above depicts the most typical modifier: yellow. Used to help determine the color grade of a diamond. The tray, sometimes called a trough, has a wedge shaped groove long enough to put several diamonds in it, including master-stones. The non-fluorescent off white surface color is included with the GIA Diamond Lite or many dealers offer paper versions. Also see master comparison stones. For a colored diamond, the basis of its color. This can include foundations described as natural, enhanced, high pressure and high temperature (HPHT)-treated, etc. 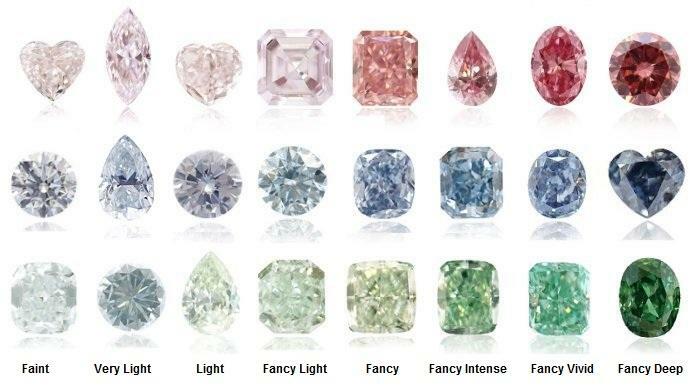 Color patches that has been noted in synthetic blue diamond but does occur in natural diamonds. A term commonly used in colored stones. Often referred to as “zonal”. A type of fracture that is non-diamond such as glass. Resembles a shell-like smooth surface. A diamond (also known as a blood diamond) mined to fund violent conflict and/or civil war against a legitimate government. Such mining is, typically, also linked to dire human rights abuses. Blood diamonds have originated in Africa: Angola, the Central African Republic, Côte d’Ivoire, the Democratic Republic of the Congo (DRC), Liberia, the Republic of Congo, and Sierra Leone. It should be noted, that the amount of conflict diamonds as a percentage of world diamond production has fallen dramatically, currently resting at about 4 percent. In countries where legislation is in place prohibiting the sale of conflict diamonds, the percentages are much lower. See also Kimberley Process. Mint condition (no chips, nicks, abrasions, etc. ), damaged (chipped, abraded, nicked, etc.) or broken (material (10%+) portion of diamond missing). The intensity of a diamond’s brightness, a ratio of the brightest pixels compared to all of the pixels in a face-up view of the stone. The upper portion of a diamond (above the girdle).T he part of any faceted diamond or colored gemstone above the girdle. It consists of the table and the crown facets below it. A type of inclusion. A crystal is a mineral deposit trapped inside the diamond. A crystal will affect the clarity grade. For a diamond or colored gemstone, a visible crystalline structure of variable transparency on the interior of the stone. This can occur naturally or as a result of a treatment, and typically serves as an identifying characteristic. a synthetic stone made to simulate a diamond. A synthetic (man-made) stone made to simulate a diamond. Made from zirconium dioxide, CZ can be distinguished from diamond by various means. the facet on the very bottom of a diamond, at the bottom of the Pavilion. The small facet polished across what would otherwise be the sharp point or tip of the pavilion of a faceted diamond or colored gemstone. This is described on a range from none (a sharp point) to extremely large (an extended, flatter surface). The 58th facet on a round brilliant. The most modern cuts of diamond are now, typically, cut with no culet, while Old European cuts would tend to have large culets. A noticeable culet, in recent times, can be lower the value. A diamond or colored gemstone shape in which the outline is square or rectangular, with rounded corners and/or bowed sides. See also Cut (Shape and Style). A ranking based on the combined analysis of a diamond’s proportions, polish, and symmetry — factors that determine the way light interacts with the stone. The cut of a diamond refers to its proportions and finish and is often referred to as the “make” of the diamond. The angles of the facets, the symmetry of the diamond and the quality of the polish all affect the cut grade. A visual assessment of the diamond can give a good indication of the cut grade, though measurement of the facets and various angles is required for a truly accurate grading. For example, the amount of brightness (or brilliance) a diamond exudes gives a good indication of the grade; the brighter the diamond, generally the better the cut grade. GIA’s cut grades for round brilliant diamonds range from Excellent (EX) to Very Good (VG) to Good (G) to Fair (F) to Poor (P). GIA does not give cut grades on fancy shaped diamonds (i.e. non-rounds). A description of the silhouette or form created by the contours and facets of a diamond or colored gemstone. Shapes vary from round to fancy cuts, such as cushion, emerald, heart, marquise, oval, pear, princess, and triangle. And style includes variations of brilliant, step, mixed, and, for colored gemstones, cabochon cuts. Beautiful stones can be found in virtually any shape or style. Generally referred to someone that does one of several stages of polishing on the wheel (scaife). Can also loosely refer to a specialist who only does girdling, cleaving, sawing or lasering. The cutter must choose the position to orient the diamond in its tang and dop to attack one of twelve single grains at a perpendicular direction. Even after the position is discovered the cutter must make sure the octahedral face that includes the single grain that he is cutting off of is pointed into the wheel. Without this direction of attack or cutting position the scaife will be scored and the diamond will not cut. A cast iron wheel, used to polish diamond, that is belt or direct driven by an electric motor. Also referred to as a scaife. The trademarked GemoLite microscope by GIA, uses bright circular light with the dark-field in the background to view diamonds and gemstones under magnification. This allows the inclusions to stand out so they may be viewed without the surface reflections. A mineral that crystallizes in the cubic system and is composed of carbon with a hardness of 10 (the hardest of all naturally occurring substances on the Mohs Scale), a refractive index of 2.417, and a specific gravity of 3.52. Diamond is an allotrope of carbon (chemical symbol C). Diamonds are sub-classified into types (I and II) that distinguish and identify the concentration and location of nitrogen in their crystalline structure. Diamond is also an excellent conductor of heat and, as such, is used in the manufacture of semi-conductors. The distance between the table and the culet as measured in millimeters. the height of the diamond. Measured from the top of the table to the bottom of the pavilion or culet. Depth (height) of the diamond divided by diameter (or average width). A diamond showing no lustre or brilliance as a result of heavy inclusions (often clouds) can be described as dead. A dead stone holds far less value than a “clean” or lightly included diamond of similar proportions. These brothers were the original owners of the farm where the South African diamond rush started in 1868. They sold the farm in 1871 for 6300 pounds. Officially incorporated on March 13, 1888 by the four life governors and shareholders, Rhodes, Barnato, Beit and F.S. Philipson-Stow. Their original holdings and control of the South African rough diamonds allowed them to monopolize and therefore control the price of rough by restricting supply. Today De Beers still controls a vast majority of the supply of rough diamonds all over the world. In 1880 Cecil Rhodes founded what was then called the De Beers Mining Company after years of aggressive claim buying. This eventually was incorporated into De Beers Consolidated Mines Ltd.
Cut refers to the angles and proportions a skilled craftsman creates in transforming a rough diamond into a finished diamond. When a diamond is cut too deep, it will lose or leak light through the side or bottom. This results in less brilliance and value. An expert in diamonds and the diamond trade. A degree for which the diamond is not colorless. An organization started by Oppenheimer in 1929 to channel diamond sales through a single outlet to control stability of the market. Any workman engaged in the cutting and polishing of diamonds. (b) One who rounds up rough diamonds as a step in the fashioning of brilliants. also known as a “leverage gauge”. This instrument measures a diamond’s proportions to a 100th of a millimeter. they are often laminated (for longevity and to prevent tampering). The report provides written documentation of the diamond’s natural occurrence, weight, proportions, color grade, clarity grade, cut grade, and other characteristics and qualities of the diamond, including any treatments. Also called a “certificate”. If you have a GIA, EGL USA , AGS, GCAL, HRD, or IGI grading report or certificate, then you can be almost certain you have a diamond. Use a diamond tester – this apparatus uses heat to see if the stone is diamond. Diamond dissipates heat very quickly, so this tool is very quick and effective. The “Dot” test – draw a dot on a piece of paper and place a loose diamond (table down, culet up) on the dot. If the dot is clear (visible), the stone is most likely a simulant, such as CZ. A diamond refracts the light and thus the dot should not be visible. Please note that some baguettes and marquises may still show the dot due to their cuts. Wear test – Diamonds are very strong and only wear or abrade when they clash with other diamonds. Simulants, such as CZ, on the other hand, are softer and abrade more easily. So, if you have a very worn stone (lots of little nicks and chip, especially around the culet and on the pavilion facets (leading down to the culet), then the chances are you have a stimulant. “Doubling” – when viewed under 10x magnification, synthetic moissanite, synthetic rutile and zircon will show “doubling.” As you look through the table and rock the stone, the pavilion facet edges (underneath) and the culet will appear double (i.e. there are two of each of them). Diamonds are singly refractive, while Moissanite is doubly refractive. It included the large South African producers, the South African Government and the original Diamond Corporation. The members of this association have contracts with the Diamond Trading Co. and Industrial Distributors, Ltd. for the purchase and marketing of the diamonds they acquire. A GIA/GTL trademarked color grading instrument which includes background lighting. There are eight common diamond shapes. They are round, marquise, pear, oval, heart, princess/radiant, emerald, and trillion. The round is the most popular (the rest are called ‘fancy-shaped’). There are also other shapes created and sold by manufacturers. A marketing organization for the liquidation of diamonds from the Diamond Purchasing and Trading Co., Ltd.
A tool mounted with an industrial quality diamond to engrave or sometimes to test authenticity of diamond by the amount of damage it leaves on its surface. The fiery, rainbow colors emanating from a diamond as white light is broken-up into colors. The separation of white light into its component spectral colors. See also Fire. A cutter’s holding device used while polishing diamond. The dop would be held by the tang. In some automated diamond cutting systems the dop and tang are incorporated into one design. Some gemstones due to crystalline structure refract (bend) the entering light in two different directions. Synthetic Moissanite, the popular diamond imitation, is doubly refractive. Diamond is singly refractive. heavy polish lines emanating from a cavity or other surface inclusion. A combination of hardness, toughness, and stability that describes the ability of a specific diamond or colored gemstone to resist wear. European Gemological Laboratory or EGL is a privately owned, for-profit, gemological lab. EGL has numerous labs around the world. EGL USA split from EGL and became independently owned in 1986. It has labs in New York, Los Angeles, Vancouver and Toronto. A modern day weighing device for diamonds and gemstones relying on electronic circuitry versus a mechanical balance. All of the diamond shapes made up of arcs or curves as in the round brilliant, oval, marquis and heart shape versus the straight edge shapes as in the emerald cut etc. A diamond or colored gemstone shape in which the outline is rectangular with cut corners, and the facets are rectangular and trapezoidal. See also Cut (Shape and Style). angled openings (inclusions) at the surface, which protrude into the diamond. Highly unusual but can easily be mistaken for laser drill holes. They can vary in length and usually form straight lines or step-like patterns. They are hollow and when they break the surface of a diamond the hexagonal or rectangular cross section is apparent. Etch features are easiest to pick out by their angular patterns versus the straight or slightly bent direction of the laser drill hole. Called “Etched Channels” on GIA reports. sometimes, the cutter will add an extra facet. Sometimes, the cutter will add an extra facet (so, there are 59 on a round brilliant, for example) often around the girdle, in order to remove an inclusion. While this is not optimal, an extra facet does not necessarily reduce the value of the diamond. The size, positioning and effect of the extra facet on the diamond’s symmetry will determine any variance in the value. An additional small, flat surface on a diamond or colored gemstone. In clarity-grading, eye-clean diamonds should have no inclusions that are visible through the table to the unaided eye. Typically, when the diamond is of SI quality or better clarity. One of the small, flat surfaces that is polished on a diamond or colored gemstone. The plane surfaces of a diamond created by diamond polishing. Round brilliant cut diamonds have 57 or 58 facets (with a culet), for example. a girdle produced with approximately 32 small flat planes. On a diamond or colored gemstone, a girdle that is cut and polished for maximum surface reflection, with many flat planes around the circumference of the stone. the color of the diamond, other than white (D to Z on the color grading scale). Fancy colors include fancy yellow, fancy red, fancy blue, fancy green and fancy pink, among others. Fancy color diamonds often worth more than those diamonds in the D to Z color range, with blues, greens and reds worth more than any others. fancy shaped diamonds refer to all diamonds that are not round. These include, but not limited to emerald cuts, cushions, radiants, Asscher cuts, ovals, marquises, pears and princess cuts. A diamond or colored gemstone shape other than round. an internal inclusion or fracture that appears like a small white feather. A feather affects the clarity grade and, thus, the diamond’s value. A fracture in a diamond or colored gemstone that typically breaks the surface. Also known as fracture filling, a treatment that introduces a glass-like material in the natural feathers or fractures of a diamond or colored gemstone. For diamonds, this process enhances the appearance of clarity. While the treatment is stable for normal wear, it is not considered permanent. In most cases, should damage to the treatment occur, the diamond can be repaired and its enhancement restored. For colored gemstones — such as alexandrites, emeralds, rubies, and tourmalines — feather filling can also enhance the appearance of clarity. In addition, it can improve durability. the final detailing or finish of a diamond is comprised of polish and symmetry. Polish is the overall condition of the diamond’s surface. Symmetry is the exactness of the shape and placement of the facets. An identifying characteristic in a diamond or colored gemstone, similar in appearance to a feather. The analysis of a diamond’s polish and symmetry. Polish relates directly to the quality of the overall surface condition of the diamond. Symmetry relates to facet shape and arrangement, and the overall exactness of the stone’s contour and outline. Both are rated on a scale ranging from poor to excellent. it is evident when white light is dispersed into its spectral colors. Flashes of rainbow or spectral colors seen in diamonds or colored gemstones as a result of dispersion. Diamonds with larger tables tend to show less fire. However, the right combination of lower girdle facet length, crown angle and pavilion angle can still result in a fairly high level of fire. the dark reflection of the girdle within a shallow diamond. Poorly cut diamonds (i.e. not deep enough) are worth less than a well proportioned diamond of a similar weight, color and clarity. Fracture filling is usually accompanied by the flash effect which would include shades of blue, violet, green and others. More than one of these colors may occur in a single diamond but they will clearly be separated. an inclusion, such as a blemish, fracture or cavity. Flaws are listed in the “Key to Symbols” on diamond grading reports. a diamond with no inclusions. The property in many diamonds that makes them glow in an environment rich in ultraviolet light. Diamonds can fluoresce in a number of colors, but generally all but blue are to be avoided. Faint to medium fluorescence is rarely detected under ordinary lighting conditions. Strong or very strong fluorescence may make a diamond appear ‘milky’ or ‘oily’, especially in sunlight. Blue fluorescence may enhance the color of diamonds rated ‘H’ in color or below (I,J, etc.) by hiding their yellow tint. Diamonds rated D-F with medium+ fluorescence may sell at a discount. common term for the four primary characteristics of a diamond. Four primary characteristics of a diamond – carat, cut, color and clarity. An industry phrase used to describe a diamond’s characteristics, all starting with the letter “C”: carat weight, clarity, color, and cut. a major inclusion in a diamond that looks like a crack. This is detrimental to the diamond’s clarity grade and value as a fracture is a point of weakness in the diamond and can spread, potentially causing the diamond to break. A chip or break on a diamond that is not in the direction of a cleavage plane. Irregular in shape, they usually appear step-like or as a splinter. Possibly wear and tear from everyday abuse in a ring but more likely the cutter has done a poor job polishing the facets. Could be caused by cutting off grain or by a wheel that has not been properly cared for. A description of a brilliant cut, round diamond or colored gemstone with 57-58 facets. Also referred to as GemoLite, a trademarked microscope by GIA for the purpose of viewing diamonds and gemstones under magnification. It features light and dark field illumination, stereoscopic zoom magnification, a swivel base, an adjustable baffle, a diffuser and a diaphragm. A mineral, rock, organic, or inorganic material that is, typically, cut and polished for use in jewelry. There are dozens of types of gemstones — including diamonds, colored gemstones, and pearls — each with a unique set of physical and optical properties. General Electric Pegasus Overseas Ltd. the innovators of the original HPHT treated diamonds. the foremost gemological lab. See the GIA link on our site or online at www.gia.edu. A trade term for round diamonds that meet GIA’s criteria for Excellent Cut, Excellent Polish, and Excellent Symmetry. Gemological Institute of America Gem Trade Lab. The well-respected independent laboratory which grades diamonds and includes a diamond grading report with each diamond. The (usually) narrow area between the crown and pavilion on the perimeter of the diamond. The outer edge of a diamond which forms a band around the stone. A girdle can be further described as bruted, faceted, polished, or a combination of these. A girdle separates the crown from the pavilion facets and will vary in thickness depending on a stone’s individual style and shape. The girdle can be as thin as “Extremely thin,” which can be an area of weakness on the diamond, or as thick as “Extremely Thick.” A mid-range thickness being preferred such as Thin to Medium. Today’s girdling machine is driven by an electric motor. It is similar to a lathe for the purposes of rounding the elliptically shaped diamonds. The two major types used today are the single and double spindle machines. 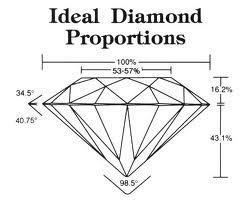 The measurement describing the percentage of the diamond’s average girdle diameter. Gemological labs, appraisers and independent gemologists grade diamonds and often provide a certificate or report for that diamond showing the size, shape, color, clarity and other characteristics. The GIA laboratory grading standards are considered the most accurate. GIA is a non-profit organization and the foremost industry expert in grading diamonds. Sometimes called a ‘certificate’, although labs do not ‘certify’ diamonds. The grading report, issued by an independent laboratory, should accurately describe the proportions, weight, color, clarity, symmetry, polish and possible fluorescence seen in the diamond being evaluated. There are twelve separate grains in diamond even when not visible. These grains must always be considered by the cutter when choosing a cutting position in relationship to the wheel (scaife). Each of the eight octahedral faces are made up of three grains, which that must be taken into account by the cleaver when cleaving (splitting), the diamond. An old style term used to describe carat weight in 1/4 carat increments. A two grainer is a 1/2 carat, a 3 grainer is a 3/4 carat, etc. lines or curves that appear whitish, colored or reflective. These lines are caused by irregularities in the crystal growth. Lines or patterns visible at the juncture between two crystals, formed either on the surface or within a diamond or colored gemstone. A weight increment never used to weigh diamond but for the purpose of weighing precious metals. There are five carats in a metric gram. There are twelve grains in a diamond crystal making up eight octahedral faces in the isometric or cubic system. Often called twinning lines, wisps and knot lines. This irregularity in the granular structure of the diamond causes the parallel lines that can be colorless or tinted in off-white or other subtle tints, that can affect the clarity of the diamond dramatically. Composed of pure carbon like diamond, but of a different molecular arrangement, giving it very different properties. Due to diamond’s high affinity for grease, the grease belt is an effective method of separating the rough diamond from the crushed diamond-bearing gravel by washing it across a conveyer belt allowing the diamond to stick. A slanted rocking table that shakes the diamond-bearing gravel downward, allowing the rough diamond to adhere to the thick layer of grease. Also See Grease Belt. The ability of a diamond or colored gemstone to resist scratching. The measurement of resistance to permanent deformations A diamond is the hardest specimen in nature. On the Mohs hardness scale, the hardness of a diamond is a 10, the hardest rating of all. A diamond or colored gemstone shape in which the outline is like its name: heart-shaped. A precise diamond cut that creates a unique, romantic facet pattern. Viewed through its pavilion, the stone shows a circle of hearts. And through its crown, it reveals arrows. The diagram below depicts a symmetrical hearts & arrows cut. For diamonds, a treatment that applies extreme pressure and temperature to cause the addition or deletion of color. HPHT can transform pale diamonds into vibrant fancy colors. And it can shift brown-toned diamonds to more delicate hues such as colorless, near colorless, pink, yellow, yellow/orange, orange, and green/yellow. High Pressure High Temperature treatment process. See Color Enhancement. The basic impression of a color; the aspect that gives color its identity. The primary impression of color such as red, green, or blue. In colored diamonds, a lab might give a diamond one or two or three color grades. For example, a diamond might be a fancy yellowish, brownish orange. The latter color is the most dominant hue and the one that affects the value the most. International Gemological Institute. A laboratory which offers a grading report. IGI also produces written appraisals. A privately-owned gemological lab with offices in Antwerp, Dubai, Hong Kong, Los Angeles, Mumbai, New York, Tel Aviv, Tokyo, and Toronto, among other cities. A naturally-occurring imperfection in a diamond. Some examples are: feathers, crystals, needles, clouds and pinpoints. Diamond with a significant amount of inclusions. I1, I2, I3 diamond often have inclusions that are visible to the naked eye. The integrity of the diamond may be compromised by the inclusions. Also See Clarity Grade. I1 The “I” stands for imperfect in the GIA clarity grading scale. The “1” represents the first level of the imperfect range (before I2 and I3). I2 The “I” stands for imperfect in the GIA clarity grading scale. The “2” represents the second level of the imperfect range before I3 and after I1. I3 The “I” stands for imperfect in the GIA clarity grading scale. The “3” represents the third level of the imperfect range after I1 and I2. At this writing, the angles agreed upon for the crown are 34.5 degrees and 40.75 degrees for the pavilion (bottom). These angles are measured from the plane of the girdle. A diamond with exceptional cut grade quality, ranked by a combined analysis of its proportions, polish, and symmetry. Physical aspects of a diamond or colored gemstone that help to confirm its singularity or categorization. These can range from inclusions (fingerprints, needles, etc.) to modifiers caused by treatments (crystals with halos, reduced silks, etc.). In addition, identifying characteristics can refer to instrument-based measurements such as refractive index, x-ray fluorescence, infrared spectra, Raman spectra, or specific gravity. Internally flawless clarity grade (only very minor surface inclusions allowed). A generic term used by non-gemologists for inclusions or blemishes. an internal clarity characteristic in a diamond. An internal feature on a diamond or a colored gemstone, such as crystals, needles, pinpoints, clouds, cavity, feather, internal graining, pinpoint, graining, twinning wisp, laser drill holes, etc. The more inclusions your diamond has, the lower the clarity grade and the lower the value, especially if laser drill holes are present. Inclusions can also extend into the diamond from the surface. These include bearded girdles, bruises, cavities, chips, feathers, indented naturals and knots. A portion of the original surface of a rough diamond left by the cutter when polishing and faceting a diamond. Indented naturals are usually on the girdle and break the outline of the stone. Generally speaking it is a non-gem quality diamond that is used for tools and abrasives. Some tools require higher clarity or gem quality for better integrity in their applications. Part of the electromagnetic spectrum that is not visible to the human eye, between approximately 800 nanometers (longer than red in the visible spectrum) to 1 millimeter (bordering microwave). A representation of the vibrational modes of a diamond’s or colored gemstone’s molecules over a range of wavelengths outside of the visible spectrum. They are recorded on a graph that plots intensity against wavelengths. And they can help identify the species and/or variety of stone. The modern proportions are designed to capture light by not allowing it to escape until it has entered, reflected, refracted and exited out of the crown facets where it is viewed. Also see critical angles. In a diamond, a flat channel-like feature created by a laser beam during the treatment of an included crystal. The internal laser drill extends from the inclusion to the stone’s surface, where it appears as a linear feature. A diamond treatment, also called Kiduah Meyuhad (KM) or “special drill” in Hebrew, in which a laser beam is focused directly on an inclusion to create a feather-like fracture between the inclusion and the stone’s surface. The inclusion is then treated with acid to improve the perceived clarity of the stone. This type of laser drilling is, typically, more challenging to detect than traditional laser drilling. On most lab reports, internal laser drilling is clearly noted. This is accomplished using neutron or electron bombardment. While irradiating a diamond might improve the color, it is an enhancement technique and consequently, has a negative impact on value. The GIA will specify on a grading report if the diamond has been irradiated. The use of radiation to alter the appearance of a diamond, colored gemstone, or pearl. On a diamond or colored gemstone, radiation such as neutron or electron bombardment can change the internal structure and, therefore, the stone’s color and perceived clarity. This process is often followed by heating, which can further refine the results. Irradiation can create vibrant pink, yellow, green, and green/blue hues in diamonds, as well as beautiful blue topazes and red tourmalines. On certain pearls, such as freshwater or Akoya pearls, gamma ray treatments can generate darker gray, blue, or black colors. Also commonly called the cubic system. Diamond’s crystallographic system with three equal length axes running perpendicular to one another. It is a credit rating and information agency for the industry. A major diamond mining company in the early diamond history of South Africa. By 1888 after much struggle the Kimberly Central Mining Company was controlled by Cecil Rhodes and Barney Barnato. The Kimberley Process (KP) is a joint governments, industry and civil society initiative to stem the flow of conflict diamonds. The Kimberley Process Certification Scheme (KPCS) imposes extensive requirements on its members to enable them to certify shipments of rough diamonds as ‘conflict-free’. In a diamond, an included crystal that extends to the surface. A transparent crystal that extends to the surface of a diamond. An extremely thin girdle where the crown and pavilion meet with no protective area at all. Very apt to chipping or nicking. Commonly seen in Old European Cut and Old Miner Cut Diamonds. A man-made stone (also known as synthetic) typically created through high pressure and high temperature (HPHT) or chemical vapor deposition (CVD). Unlike simulated diamonds (such as cubic zirconia), which merely look like diamonds, lab-grown diamonds have essentially the same chemical, physical, and optical properties as natural diamonds. Light amplification by stimulated emission of radiation. Alaser beam is capable of cutting into and dividing a diamond on any given plane. The advantage of laser cutting is the flexibility of direction since grain does not play a role in this method like it would in sawing. A minute channel from a diamond’s surface to its interior, created by a laser beam during the treatment of an included crystal. A diamond enhancement technique whereby a laser is used to drill to an inclusion which is then bleached to enhance the diamond’s appearance. A diamond treatment in which a laser beam creates a channel to allow access to a dark inclusion. The inclusion is then lightened with acid, to improve the perceived clarity of the stone. A tiny tube created in a diamond by laser drilling, which is often done to treat diamonds. A hole made in a diamond by laser drilling. This technique is used to reach a black pique in order to bleach it (with acid) and improve the look and clarity of the stone. However, as this is a treatment, it materially (negatively) impacts the value of the diamonds. labs inscribe the grading report or certificate number on a diamond’s girdle. Using a laser, labs can inscribe the grading report or certificate number (or client reference) on a diamond’s girdle. This has no impact on the diamond’s value, but makes it easier to identify the diamond. A well known company specializing in ideal cuts and started by the very famous cutter, Lazare Kaplan. LKI has also teamed up with General Electric in Pegasus Diamonds who specializes in a diamond color lightening treatment. A phenomenon that occurs in diamonds and colored gemstones when light entering a stone fails to reflect back through its crown, dispersing instead through the pavilion. Generally, the stone to the left will appear slightly darker than the stone to the right in the process of color grading. The combined impact of brilliance, contrast, and radiance of a diamond as seen by the human eye under normal lighting conditions. These terms are defined and their impact is measured by a light behavior assessment system. Depending on the severity, it can look like a burned area on the surface of the diamond. It is caused by a cutting position that is not perpendicular to a grain. Also See Polish Marks. Not mounted. Usually stored in a parcel paper. a small, handheld magnifying glass used to view diamonds. A 10x loupe is standard, but other powers are available (14x, 20x, etc.) 10x magnification is the standard. Triangular facets just below the girdle. The facets on the pavilion of a round brilliant just below the girdle. the quality of shining by reflecting light from the surface of a diamond. A mutation in rough diamond crystal that has grown in two separate directions creating a twinned crystal. The orientation of the twins are 180 degrees in respect to each other. Generally very difficult to polish due to the conflicting grain directions. See Pavilion Mains and Bezel Mains. A rough diamond that lays out in such a way that sawing or cleaving is not necessary for maximum weight retention. A diamond or colored gemstone shape in which the girdle outline is elliptical, with pointed ends. The marquise is shaped like the outline of an elongated football. The facet placements are similar to the round brilliant. The length to width ratio is an important determining factor in the overall beauty of the finished diamond. GIA’s GTL will do specific reports on master stones for color comparison purposes. GIA’s requirements to accept a diamond for a master stone report includes .25 carat or larger size, crown heights 12 to 15 %, thin to slightly thick girdles that are clean, pavilion depth of 42 to 44%, modern cuts only, SI1 or better clarities, and none or faint blue fluorescence is acceptable. For round diamonds and colored gemstones, an indication of maximum-minimum diameter x depth, in millimeters. Fancy shapes are indicated by length x width x depth. For round pearls, an indication of diameter, in millimeters. Other pearls are measured by length x width x depth. Measurements of pearl strands or jewelry are described as a range, average, or graduation from maximum to minimum. A term used primarily to describe small faceted diamonds of less than 0.20 carats used in jewelry. Or colored gemstones of approximately .12 carat or less. Melee can be used to frame a center stone (pavé setting) or used on its own. A short term consignment usually between dealers or a dealer and a jeweler for the purpose of showing a diamond or gemstone and having the option of returning it if a sale is not completed. A decimal system based on weights and measures. There are five carats in a metric gram. A metric measurement of distance. A standard measuring increment in the trade for describing outer dimensions of a diamond. A millimeter is 1/1000 of a meter. A style of diamond or colored gemstone cutting that features aspects of both brilliant and step cutting. Generally referring to all cuts that adhere to the acceptable standards of today’s diamond cutting. The modern cuts eliminated open culets, short lower girdle facets, steep crown and pavilion angles of the old European and old mine cuts. To capture an acceptable amount of brilliance and dispersion the angles of the modern round brilliant were set at between 30 and 35 degrees for the crown and between 39 and 41 degrees for the pavilion. Many times these angles will be ignored for the purpose of weight retention but still will be considered a modern cut. A synthetic silicon carbide developed by Moissan. A popular diamond imitation that is harder than corundum (9), but not as hard as diamond (10). A single lens tube magnification instrument used mainly in science where stereoscopic viewing is not a necessity. The portion of a piece of jewelry in which a gemstone or other object is set. A portion of the original surface of a rough diamond left by the cutter when polishing and faceting a diamond. Naturals are usually near the girdle of a diamond. Also known as Indented Natural. A natural is an inclusion that extends into the diamond from the surface. The natural can be a portion of the original surface (or skin) of the diamond (rough) or an opening left when a surface-reaching crystal is worked during polishing. These blemishes can be found on some polished diamonds when some of the rough is left on the diamond. This is often done so the cutter can maximize weight in a diamond. An elongated included crystal which is a fairly common occurrence in diamond. Can sometimes be confused with laser drill holes. A thin inclusion of variable length, in a diamond or colored gemstone. A thin, elongated crystal inclusion, which literally looks like a needle. The total price of a diamond after calculating the price per carat. A minor chip on the surface of a diamond, usually found near or on the girdle of the stone. As few as 100 atoms in every one million carbon atoms, in diamond, absorb the blue and violet end of the spectrum, resulting in yellow reflecting back to our eyes. An angle greater than 90 degrees. A well shaped diamond crystal which has a symmetrical layout of eight equilateral triangles. It has the appearance of two pyramids joined at the bases. Also referred to as an octahedron. The eight triangular faces make up an octahedral crystal. Also see octahedral crystal. A diamond cutter must polish a diamond perpendicular to a single grain at all times during the faceting process to allow material removal and a high polish. This is referred to as on grain. When the cutting position is not perpendicular it is referred to as off grain. A culet that, due to differences in the angles of the opposite pavilion facets, is off center with respect to the girdle outline. It usually results from repairing or repolishing a portion of the pavilion or from attempting to retain maximum weight from a distorted piece of rough. Old cuts have particular characteristics that do not adhere to the modern acceptable standards of the modern cut. These would include an open culet and short lower girdle facets. Angles were largely ignored but even in modern cuts they sometimes are for the purpose of weight retention. Old cut terms used are old mine, old miner, old European, modern European (transitional cut), old-English cut, rose cut, old single cut, and some may refer to the single cut as an old style. The earliest known form of brilliant cut diamond with a very small table, heavy crown and large depth. A description of a characteristic of a diamond or colored gemstone that is neither transparent nor translucent, so it does not transmit light. A report offered by GIA and other labs to determine the authenticity or irradiation and grade of the color of the diamond in question. A diamond or colored gemstone shape in which the girdle outline is elliptical or oval. Due to lack of knowledge or ethic, many dealers assign higher color and clarity grades to their diamonds, which gives the illusion of higher value. a polishing technique to change the angles of the upper & lower girdle facets. This technique maximizes the weight yield from the diamond rough. Significant painting can retain 3% of the diamond’s weight, which might be important if you are close to the 1 ct mark. In addition, digging out can remove clarity characteristics (inclusions). This results from light reflections. The portion of a faceted diamond or colored gemstone that lies below the girdle. The underside of the diamond between the girdle and the culet. The angle measured between the girdle and the pavilion main facet. The angle formed by the plane of the pavilion facets and the girdle. 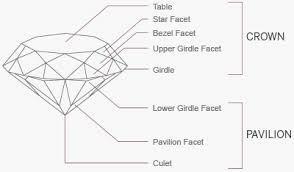 The eight facets found on the pavilion of a round brilliant diamond. Their points touch the girdle. A diamond or colored gemstone shape in which the girdle outline is teardrop- or pear-shaped. Abbreviated DWT. It is a measurement of weight generally used for precious metal. It is equal to 1/20 of a troy ounce. The capacity of a diamond or colored gemstone to emit visible light for a variable period of time after exposure to long- and short-wave ultraviolet rays. Light emitted from a gem after a stimulating energy source has been removed. Notable examples include The Hope Diamond and The Wittelsbach-Graff Diamond, which phosphoresce intense orange-red after exposure to short wave ultraviolet light. Inside a diamond or colored gemstone, a minute, circular inclusion. They are very small crystals that look like dots under 10x magnification. They are not eye visible. On a diamond’s surface, a miniscule indentation. a heavy, grayish-white, highly malleable and ductile metallic element, resistant to most chemicals, practically unoxidizable except in the presence of bases, and fusible only at extremely high temperatures. Platinum is one of the most rare and pure precious metals. Used for jewelry, platinum is usually 90-95% pure. It rarely causes allergic reactions and resists tarnishing. Platinum is considerably denser than gold or silver and is extremely strong and durable. A schematic diagram that approximates a diamond’s style and shape, and notes its external and internal characteristics. On lab reports or certificate, the facets are printed in black and the characteristics are denoted in red and green, by the symbols. A measurement in the weight of a diamond or colored gemstone equal to one one-hundredth of a carat (1/100th). Thus, 0.50 carats is equal to 50 points. The overall condition of the diamond’s surface. Diamond can take a better polish than any other gemstone, due to its hardness. However, as result of this hardness, diamond has to be polished with another diamond. Polish is graded on a scale of Excellent to Poor and each tick down in grade (caused by abrasions, nicks, scratches, etc.) reduces the value of the diamond. The way the cutter finishes the facets on a diamond. Labs grade finish from poor to excellent. Small parallel lines left on the surface of a diamond’s or colored gemstone’s facets by a rotating polishing/grinding wheel. Fine, parallel grooves and ridges remaining after the polishing process. Heavy polish lines emanating from a cavity or other surface inclusion are known as drag lines. On a diamond or colored gemstone, a girdle that has been cut and polished to yield a uniform, highly reflective surface. A general reference to a diamond cutter that does the faceting stage of the cutting process. The faceting of a diamond. The fainter the polishing lines on the surface of the finished diamond the better the polish is. Caused by cutting off-grain or a smoothing ring on the cutting wheel (scaife), that has not been properly cared for. Even in excellent polishes at least very faint lines will likely be detected under 10x magnification. First designed and manufactured by GIA in 1967. It is an instrument that casts a silhouetted image of a diamond that allows us to check the exact proportions of the subject. The diamond trade generally prices diamonds, polished or rough, in a price per carat format. The only time the price per carat and the total or net price is equal is when the diamond in question is a 1.00 carat even. The Rapaport Diamond Report lists all diamonds in price per carat. A diamond or colored gemstone shape in which the outline is either square or rectangular, with pointed corners. On a diamond or colored gemstone, the dimensions and facet angles, and the relationship between them. The amount of reflected and refracted light in a diamond, sometimes referred to as sparkle or life, measured in a face-up view. are square or rectangular mixed cuts with angled corners. A representation of the vibrational modes of a diamond’s, colored gemstone’s, or pearl’s molecules as they react to a monochromatic (laser) light source. For diamonds, the Raman spectra measure photo luminescence to detect treatments to the stone. For all stones, Raman spectra are recorded on a graph that plots intensity versus frequency. And they can help identify the species and/or variety of stone, as well as any applied treatments. Many times an old style cut such as the old European or old mine cut will be re-cut (re-fashioned) to improve upon its beauty, salability and value. If a diamond is chipped a full re-cut may be required to improve its salability. Also see repair. Light beams that bounce off the surface of the diamond versus transmitted light that enters the diamond. Also see angle of reflection, angle of incidence and critical angles. The return of light that strikes the surface of a diamond or colored gemstone. This effect can also occur when light strikes specific inclusions within a stone. The change in direction of a ray of light as it enters a diamond or colored gemstone. Diamond’s refractive index is 2.417. The ratio between the speeds of light traveling through air versus the subject at hand. As light enters diamond it is refracted or bent exposing the array of spectral colors in white light. Refraction is critical to dispersion. Also see dispersion. The degree to which visible light bends as it passes through a diamond, colored gemstone, or pearl. Each type of gemstone exhibits a unique refractive index (RI) or RI range — a result of its distinct chemical composition and physical crystallization. As such, RI is a strong identifying characteristic. Extremely imperfect. In the Britain clarity scale it is below “heavily spotted”. The equivalent of two grades below GIA’s I3. By GIA’s standard it would be considered off the scale. Many times the diamond dealer/cutter will opt to repair a diamond instead of a full re-cut, to maximize weight retention. Only a portion of the diamond’s facets are affected around the area of the chip or nick. A repair versus a re-cut will usually have a negative impact on the symmetry of the finished diamond. Any uncut or unpolished diamond or colored gemstone. A diamond that has not been cut and polished. An Englishman who moved to S. Africa for health reasons. He joined his brother in diamond prospecting and they soon became very successful in the diamond rush. He collected several claims and eventually formed the De Beers Mining Co. Rhodesia was named after him for his positive influence on the region. He was the first appointed chairman of De Beers and held that position until his death in 1902. White gold is often plated with a thin rhodium layer to improve its appearance while sterling silver is often rhodium plated for tarnish resistance. A diamond or colored gemstone shape in which the outline is circular. The modern round brilliant consists of 58 facets (or 57 if the culet is excluded). It is the intensity or strength of the hue. For example a fancy yellow with added saturation might be considered an intense fancy yellow. An attribute of color that denotes its strength. The area or imaginary plane the diamond sawyer has chosen in order to saw the rough diamond into two pieces. The grain is of much importance in the limitations as to where the saw plane may exist. Many times the sawyer will choose an off center saw plane to get two different sizes in the final products. A large portion of the rough diamonds mined today are sawed into two pieces for the purpose of weight retention. Sawing is generally done on well formed octahedron crystals which leaves two pieces that generally yield 50 to 55% in the finished product. The disadvantage of sawing is the limited directions in which the rough can be divided, due to the rules of cutting on grain. Also see saw plane. A person who specializes in the sawing of diamonds. The secondhand market is considered anything that has been resold by an end user. Pawn shops and businesses established for the purpose of buying from the public or other pawn shops and secondhand buyers would be considered part of the secondary market. Mirror-like reflections from the facets of a diamond as it turns in the light. A combination of the sparkle and pattern of a diamond. Sparkle is the appearance of spots of light that flash as the diamond moves. Pattern is the arrangement and contrast of the bright and dark areas of the diamond resulting from light reflections. The tiny flashes of light noticeable in a diamond when the observer moves his/her head. On the surface of a diamond or colored gemstone, a white, narrow, shallow marked caused by abrasion. A thin, dull, white line on the diamond’s surface. Can be removed by re-polishing, but the diamond might lose a little weight. Diamonds are cut into numerous shapes, with the most popular being round brilliant. Also referred to as fancy cuts, shapes include round, marquise, cushion, emerald cut, pear, heart, trillion, radiant, princess cut, Asscher, oval, Old European cut, old mine cut, baguette, half moon, among others. clarity grade of slightly included (SI1 and SI2). An imitation diamond, such as cubic zirconia, that looks like a diamond, but does not share its combination of chemical, physical, and optical properties. Traditionally, a round cut for a diamond or colored gemstone with 17 facets: nine crown facets (including the table) and eight pavilion facets. Diamond is singly refractive since the light traveling through it has a consistent refractive index regardless of the direction it enters. Moissanite, the popular diamond imitation, is doubly refractive due to its anisotropic crystalline structure. A piece of jewelry containing a single diamond or colored gemstone. A major diamond producing country on the African continent. The diamond rush in the late nineteenth century started in South Africa. De Beers Consolidated was initiated in South Africa. the appearance of spots of light that flash as the diamond moves. A group of gemstones that share similar chemical composition and physical structure. Examples of species include beryl and corundum. See also Variety. The ratio of the density of a solid or liquid to the density of an equal volume of water (or for a gas, to an equal volume of hydrogen). When the spectrum of white light is exposed via refraction, the colors are in order of their wave lengths with the shortest first: red, orange, yellow, green, blue and violet. A term that is used frequently in the diamond trade to refer to a stone that has been cut with a large table and a thin crown, to retain greater weight from the two sawn pieces of an octahedron than is possible by using ideal proportions. In a strict sense, any increase in table diameter over the ideal 53% constitutes spreading; however, it is a general trade practice to apply the term only to those stones with tables that measure in excess of about 60%. Ability of a diamond or colored gemstone to maintain its integrity under normal conditions. One of the eight triangular facets found on the upper crown section (next to the table) of a brilliant-cut diamond. A style of diamond- or colored gemstone-cutting that creates straight facets that run parallel to the girdle and decrease in size as they move further from it (resembling steps), as in an emerald cut. A cutting style in which narrow, rectangular diamond facets are arranged in rows parallel to the girdle on both the crown and pavilion. Step cuts are polished in a parallel-horizontal facet arrangement as in the emerald cut and baguette. On a diamond, colored gemstone, or pearl, the application of a thin artificial layer on the stone’s exterior to impact appearance. Coatings are, typically, not considered permanent; their effects may diminish over time. On a diamond, chemical coatings can disguise less desirable interior hues. On a colored gemstone, coatings can improve color and overall appearance. And on a pearl, coatings can create the illusion of a smoother surface and/or enhanced luster. An irregularity of the crystal structure of the diamond. It appears as a line traveling across one or more facets, which can be mistaken as polishing lines, especially when occurring in a multiple pattern. Grain lines will be more obvious than polishing lines and polishing lines will be in larger numbers running close together. A single grain line can run across several facets in a continuous line, whereas polishing lines will at least change directions slightly from one facet to the next. Sustainable origin refers to the environmentally-friendly source of a diamond or colored gemstone and, if applicable, its related jewelry material. This can include heirloom and reclaimed items, as well as newly mined items that are conflict-free and ethically-sourced. Symmetry is the exactness of the shape and placement of the facets. A diamond should look symmetrical. It should be round (as opposed to off-round), the table should be in the middle of the crown (i.e. you should see equal amounts of the pavilion each side of the culet when viewing the diamond through the table), the culet should be in the middle of the table (i.e. the culet should be centered on the pavilion), the girdle should be flat (as opposed to being wavy), among other symmetries. Labs grade symmetry from poor to excellent, based on the diamond’s proportions and the relation of one facet to another (meet-point faceting). a man-made diamond created to simulate a diamond. It’s created by using high pressure high temperature (HPHT) or lab grown using chemical vapor deposition (CVD) process. GIA and other labs can determine whether a diamond is natural or synthetic. A laboratory grown diamond with essentially the same chemical composition and crystal structure as a natural diamond. Synthetics should not be confused with simulants, which have different optical and physical characteristics. For more information please visit. The horizontal, top flat facet on the crown of a faceted diamond or colored gemstone. The largest facet which sits on top of a diamond. This is where most of the light enters and exits a diamond. For a round brilliant cut, the average width of the table as a percentage of the average diameter of the diamond. The width of the table divided by the average diameter. For fancy shapes, it is the width of the table as a percentage of the width of the entire diamond. A method for determining the depth of the pavilion. The size of the reflection of the table which is viewed through the table and is located around the culet, determines the depth of the pavilion in question. In the ideal 43%, the shadow or reflection covers about 1/3 of the distance between the culet and the edge of the table where two stars join. With the reflection reaching 1/2 of the distance the depth is approximately 44.5% (too deep). As the reflection gets smaller the depth is shallower and with a greater depth the reflection is larger. Easy to remember larger is deeper, smaller is shallower. Again the ideal marker is the 43% depth (40.75 degrees) with the reflection extending 1/3 of the way between the culet and the table corner (where stars join). An attribute of color that denotes its lightness or darkness. The ability of a mineral or gemstone to resist breakage. Jadeite is the toughest gemstone due to an interlocking molecular structure that helps to minimize its weak points. A term used for diamond with a light tint of brown to the body of the diamond rather than yellow. A term used for very, very light brown diamond with a light tint of brown to the body of the diamond rather than yellow. The amount of light transmitted through a diamond or colored gemstone. It is influenced by the texture of the material itself and the presence of inclusions. Transparency is rated on a scale of transparent (typically preferred), semi-transparent, translucent, semi-translucent, and opaque. The application of processes or agents to enhance the perceived color, clarity, phenomena, or durability of a diamond, colored gemstone, or pearl. Treatments are routinely applied to stones, with measurable results. For diamonds, see also Annealing, Feather Filling, High Pressure and High Temperature (HPHT), Irradiation, Internal Laser Drilling, Laser Drilling, and Surface Coating. For colored gemstones, see also Bleaching, Diffusion, Dyeing, Feather Filling, Heating, Impregnation, Infusion, Irradiation, and Surface Coating. For pearls, see also Bleaching, Dyeing, Heating, Irradiation, and Surface Coating. a diamond that has been altered to affect color or clarity. See Irradiated Diamond and Color Enhancement. A three-sided diamond or colored gemstone shape in which the outline is like its name: triangular. A magnifying instrument for the viewing of small objects, especially gemstones. The three lenses are designed to correct for spherical and chromatic aberrations (distortions). Visible line on or within a fashioned diamond, caused by twinning in the crystal. Since the orientation on one side of a twin plane differs from that on the other, the best polishing direction for one is a poorer one for the other; as a result, a line remains at the surface. Also called knot lines. Inside a diamond, an irregular ribbon-like pattern. A series of pinpoints and/or clouds that form in the diamond’s growth plane. Light that is invisible to the naked eye because it consists of wavelengths shorter than those of visible light. A cleaning unit that vibrates the jewelry in a cleaning solution and water. Some models come with heaters and timers. One of the 15 facets found on the lower crown portion of the diamond (abutting the girdle). A subcategory of species, used to further define stones based on common color or phenomena. The beryl species, for example, includes emerald and aquamarine varieties. And corundum includes ruby and sapphire varieties. See also Species. On a piece of rough or a diamond recut or repair, weight retention is always an important consideration in value. It is the preservation of weight or the lack of weight loss during the cutting process. Well cut proportions ensure the maximum compromise between fire and brilliance. When light enters a properly cut diamond, it is reflected from facet to facet, and then back up through the top, exhibiting maximum brilliance, fire and sparkle. White gold is alloyed with Nickel or Palladium, Copper, and Zinc. It is not white in its natural state, and it is typically Rhodium plated. Sometimes dead spots in polished diamonds are referred to as windows. Many times the skin of a rough diamond is too opaque for the cutter to locate inclusions which may affect the layout of the diamond. A window will be polished on the rough, removing the skin so that a view of the internal clarity is permitted. A curvy, hair-like feature on a diamond or colored gemstone that can appear as an isolated element or in a cloud-like form. Also known as XRF, the capacity of a diamond, colored gemstone, or pearl to emit energy via secondary x-rays when exposed to a high-energy incident (primary) x-ray. The intensity of the emitted x-rays indicates the stone’s chemical elements for identification purposes. Z color is, strong yellow color and the color-grade before a diamond is graded as Fancy Light Yellow with GIA. O-P to Y-Z color is often mistaken for Fancy Yellow.